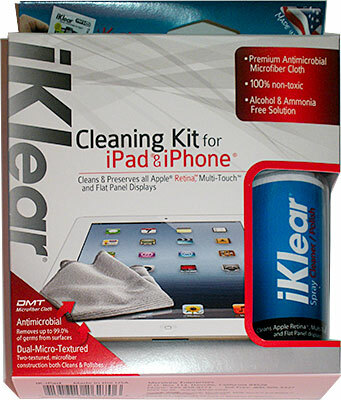 iKlear for -Cleaning iPhones, iPads, Laptop & more. Cleans and preserves all Apple Retina, Multi-Touch and Flat Panel Displays . DMT Antimicrobial cloth removes bacteria while safely cleaning smudges & oily fingerprints from Screens,Multi-touch displays. One (1) 2 oz (60ml) iKlear non-aerosol pump spray bottle. Three (3) iKlear travel Singles (wet/dry).